Lortone tumblers – How to use and mix the solution. What is Dinosaur Bone and Gembone? The first time I saw petrified dinosaur bone was nearly 19 years ago. It was a red agatized dinosaur bone also known as gembone. Gembone is made when agate fills in all the nooks and crannies of the bone leaving you with a very interesting pattern. Here is a great picture of the patterning in gembone. 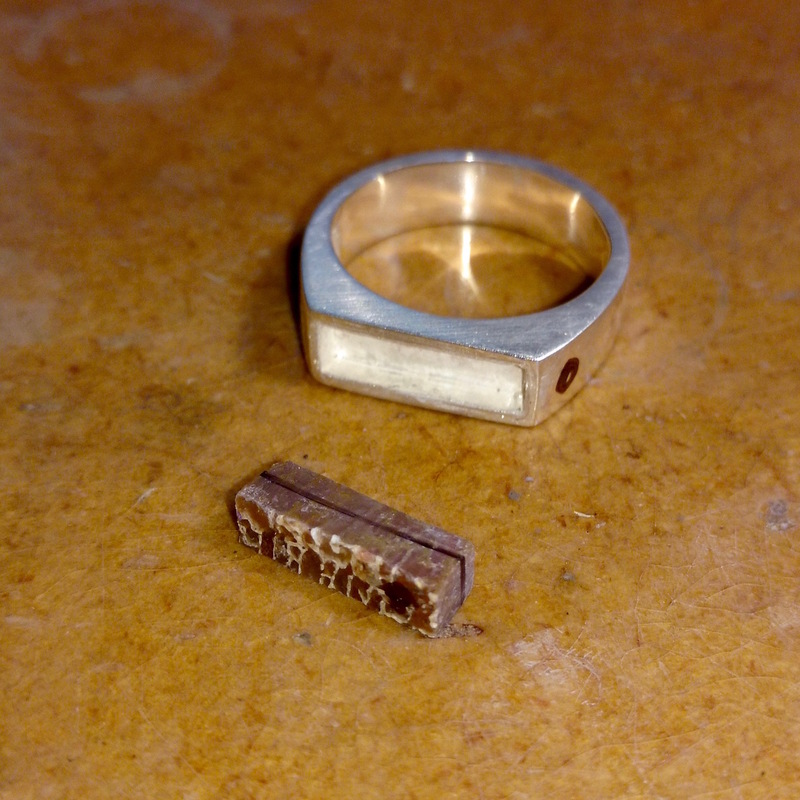 One of my favorite things to do with gembone is to inlay it into a ring. It makes a great ring for both men and women. It so happens that I was making one for a client and had the camera running. I thought I would walk you through the some of the basics. Step #1 I start with a sterling silver or a gold cast ring. The ring has a cavity in it for the gembone to be set into. This cavity could be any shape. For this example I am using a rectangle shape. Step #2 The second thing I do is select my rough dinosaur gembone and cut a piece with a trim saw. This particular piece was a sweet find. You will notice that its coloring is red with touches of green, yellows and blues. Step #3 Once I have my gembone I will need to measure the length and the width of the cavity in the ring. I always measure using dividers and I give myself 2mm more than I need. This allows for any damage that can happen when it’s cut it down to size. As the saw cuts the stone small pieces can come off the edges. This can ruin any chance that it will fit in the ring. I can alway grind some off if it is too large. Step #4 Transfer your measurements to your desired part of the dinosaur gembone. I use a black magic marker and I also scribe with an aluminum scribe stick. You can make a scribe stick with an aluminum nail from a hardware store. Step #5 I cut out the measured piece with my trim saw. I always cut all the way through the stone, as opposed to just trying to cut out the rectangle. I will end up getting two pieces. Do your long cut first and then your short cut. Step #6 Now that I have my dinosaur gembone cut close to the right size it’s time to make it fit in the ring. In this step I just try to get it close to the right size. I will have time to fine tune it later. I am using a lapidary grinder with diamond wheels on one side and a expandable drum on the other. Step #7 When I get close to the right size and I am able to fit the stone into the cavity, I mark one side of the stone with a marker. I also mark the ring as well. These two marks help to remind me which end of the stone goes into the correct side of the ring. Step #8 Slowly but surely I cut away the sides of the stone until it fits down into the cavity. This is time consuming. If you are trying this in your shop take your time and pay attention to all the sides of the stone. One wrong cut can mean you will have to start over. As I get close I use sanding sticks to trim the stone. The idea is to have the dinosaur gembone sit down into the cavity with a very tight fit. Step #9 Once the stone goes into the ring and everything looks good it’s time to glue it in. You will notice that there is a large amount of the dinosaur bone sticking out. Don’t worry about it as it will be trimmed off after the epoxy has set. This is one way of doing inlay. The other is to set the stone at the same height as the top of the ring. This would usually mean the top would already be polished and then cut from the sides and the bottom until it fit properly. Don’t get stuck doing things just one way. Both techniques are viable. Step #10 Time to trim the top of the dinosaur gembone down to the metal using a 220 grit sanding wheel on the the lapidary grinder expandable drum. When the stone is cut down to a manageable level move to a 400-600 grit sanding wheel. The finer finish you can get on the dinosaur bone, the better. Step #11 This is the last step. I use a hard felt wheel and cerium oxide to polish. I mix a little water with the cerium oxide. I like it to be toothpaste consistency. Add this to the felt wheel. Run your wheel at a low RPM and press the stone against the wheel. Check the stone frequently as it should polish relatively fast. When you are satisfied polish the silver or gold with Zam or your preferred polish. Now you are done! You can use this method with many jaspers also. Here are a couple other rings I made using these techniques. If you think this would help anyone please share and all that jazz. Thanks! Also, don’t miss out on the free tool list downloads. Previous post: Save yourself some time and your sweet money! Next post: The tool you are missing. How to use ring bending pliers. You will thank me! Anvil T-Shirt – FREE SHIPPING! Be smart! Upgrade to a faster web host. Sell more of your sweet stuff!